Drug Activity Reporter is a configuration of Survey123 for ArcGIS, Crowdsource Manager, and Operations Dashboard for ArcGIS that can be used by the general public to report suspected drug activity in a community. Drug Activity Reporter helps law enforcement agencies work hand-in-hand with the public to fight crime and neighborhood disorder. 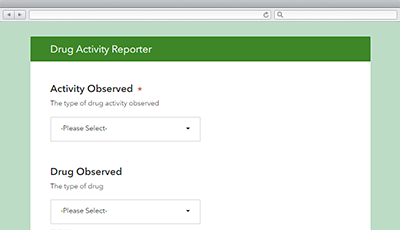 To deploy Drug Activity Reporter with the ArcGIS Solutions Deployment Tool requires specific software. Drug Activity Dashboard is only supported in ArcGIS Online and ArcGIS Enterprise 10.6.1 - 10.7. To manually deploy Drug Activity Reporter in your organization requires specific software. Survey Drug Activity Reporter A survey used by the general public to report suspected drug activity in a community. Applications Drug Activity Dashboard (Automated deployment) An application used to monitor reports of suspected drug activity submitted by the general public. Drug Activity Manager An application used to manage reports of suspected drug activity submitted by the general public. Maps Drug Activity Dashboard (Automated deployment) A map used in the Drug Activity Dashboard application to monitor reports of suspected drug activity submitted by the general public. Drug Activity Manager A map used in the Drug Activity Manager application to manage reports of suspected drug activity submitted by the general public. Feature layers Drug Activity Reporter A feature layer used to store suspected drug activity reports. Drug Activity Reporter_dashboard (Automated deployment) A feature layer view used in the Drug Activity Dashboard map to monitor suspected drug activity reports. Drug Activity Reporter_manager A feature layer view used in the Drug Activity Manager map to manage suspected drug activity reports. Group Drug Activity Manager A group used to organize maps in the Drug Activity Manager application. The Drug Activity Reporter solution includes a collection of applications. Take the Drug Activity Reporter survey for a test drive if you'd like to see how the general public can report suspected drug activity from a smartphone, tablet, and desktop computer. Take the Drug Activity Manager application for a test drive if you'd like to see how public safety staff can manage reports of suspected drug activity in the community. Take the Drug Activity Dashboard application for a test drive if you'd like to see how public safety staff can monitor reports of suspected drug activity in the community. Below are the release dates and notes for Drug Activity Reporter. Drug Activity Dashboard is supported on ArcGIS Enterprise 10.6.1.